Subject : A screenshot of a Google search result for ":(" taken from from Google Chrome and quotes "Why So Sad ? Recursion may be !" under it. "Your search - :( - did not match any documents." and it'll tell you to try different keywords! Looking at the message gives a feeling that Google actually felt really sad that it couldn't find any result for our search. LoL! There's more fun to this if you could see the recursivity of the situation because it recursively seems as if Google feeling sad when we actually searched for a smiley that represents sadness. 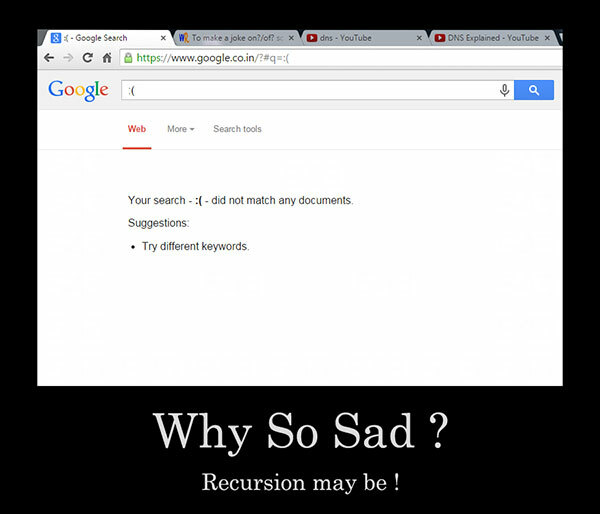 That's why it says "Recursion may be !" But why ? Google search engine usually ignores special characters and combinations of them except for some such as an 'asterisk' (*). Because otherwise if Google doesn't do that, you'd be flooded with results showing every web page containing those characters, which isn't what you want. Update : As of Dec 31, 2018, Google brings back results for emoji searches. But I don't know exactly when they started doing this.